50mm diameter chrome curtain poles fitted in Chalfont St Peter. Ideal for heavyweight curtains to make a bold statement. Swags and Tails suspended from a board across the top of a window and elaborately pleated to form the fabric into tailored scoops, paired with pleated tails on both sides and a roman blind to compliment the finished look. Ruched curtains are typically gathered or bunched on a pole. One of the stunning creations by Thefabricwarehouseltd. The curtain heading is sewn across the curtain fabric to make a channel and a curtain pole is inserted. This finish is often used for curtains that are permanently fixed in place. Ruched headings are beautiful with light fabrics such as voiles and sheers. Plissé Shades are a perfect for any window size or shape and is used on doors,standard windows,roofs, skylights, circular, sloping, and shaped windows. The stacking options for Plisse blinds are comprehensive and give you the chance to have the exact control of light you require. The small stack size when lifted gives these blinds a neat, flush finish, and they’re available in a wide range of colours and fabrics including fire-retardant types. Plissé blinds are also available with 3 fabric treatments offering solar reflection (Topar), dirt and moisture repellence (Dustblock) and antibacterial properties (Sana Plus). Electrically operated curtain tracks are ideal for homes as they offer the ultimate in luxury, You have the ability to open/close the curtains via switch, remote control or light sensor. All products are made with high grade materials by a team of experienced assembly operator. Electric track are suitable for all curtain weights. Can be ceiling or wall fixed. The discretely integrated sleek 24v Somfy motor is a real powerhouse and will effortlessly control curtain weights of up to 60kg and tracks as wide as 10 metres. Bottom up blinds also referred to as upside down blinds or reverse blinds. They work by rolling up from the bottom of the window to the top of the window using a tension pulley system. The blind can be stopped at any desired point using a cleat. 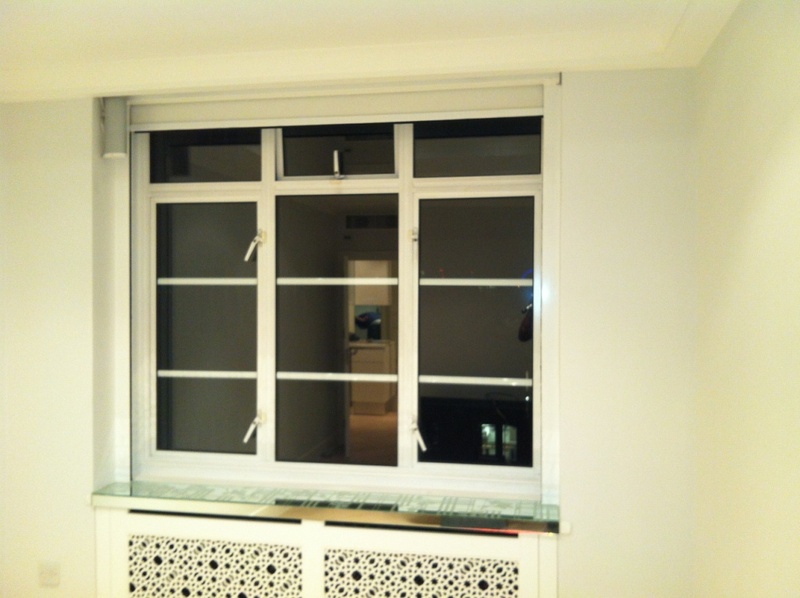 They are perfect for windows at street level or bathroom windows where you want privacy without blocking the light. The right bottom up roller blind, correctly fitted, will make a big difference to the whole look of your room. Classic, simple, elegant pelmet board and stripe roman blind fitted in Middlesex. Blinds are a very versatile window dressing; whether for privacy, black out or decorative purposes. They may be used on their own or teamed up with a hardwood pelmets for a more contemporary finish. The right pelmet board and roman blind, correctly fitted, will make a big difference to the whole look of your room.